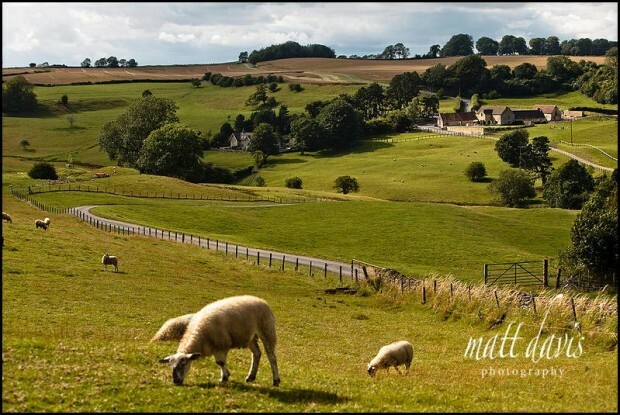 Kingscote Barn is a charming restored 17th Century Cotswold barn, nestled in a quiet valley overlooking rolling countryside. Originally part of The Kingscote Estate this Cotswold wedding venue is situated just outside Tetbury, Gloucestershire. 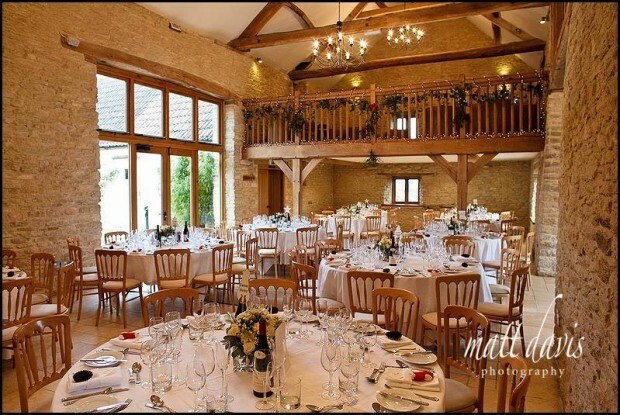 Kingscote Barn can be booked for your exclusive use, accommodating up to 150 guests. 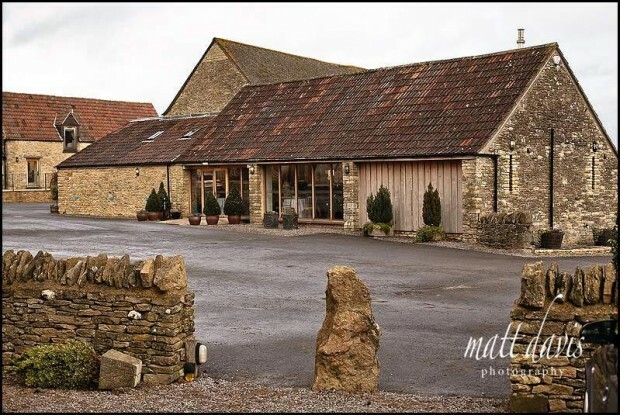 With beautiful features and the character of a stone barn set in the picture perfect surroundings this is a perfect Cotswold wedding destination. How could I not give a positive review of Kingscote Barn when they have always been so good to me, ever since the first time I photographed a wedding there back in 2008. Richard the owner is very considerate of wedding suppliers, and the ladies (at the time of writing this) who organise the weddings are fantastic. As a wedding venue it ticks a lot of boxes for brides & grooms. It’s still relatively new, and therefore is in good order, cosmetically and functionally. It’s retained some old charm, but has been brought up to date with a quality refurbishment. Kingscote Barn now has accommodation onsite for guests and/or the bride and groom to stay as well in addition to the option of the near-by cottages. The main hall works really well for the wedding ceremony and also your wedding breakfast. Table layouts can be varied and I’ve recently photographed a winter wedding where the bride had tables in two long lines (as opposed rounds). Wedding guests can spill out onto the terrace if weather permits, or retreat into the reception room at the front (as you walk in). Parking facilities are great, staff are friendly, suppliers are picked selectively based on offering a reliable, quality service. I have photographed many Kingscote Barn weddings, and have samples of my work available to view during your visits to the barn, as well as online here. 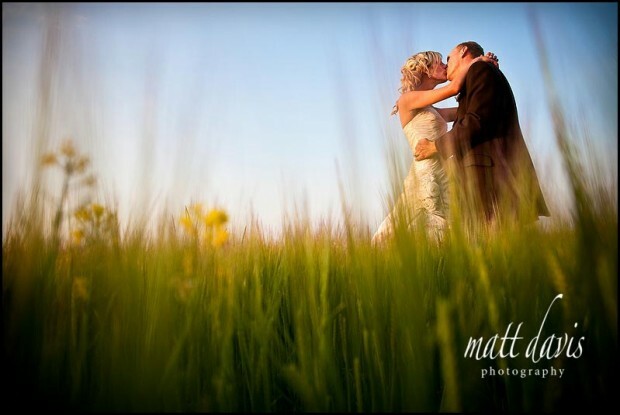 Photographs of the bride and groom can be taken around the grounds near to the barn. I also favour use of the top fields alongside the driveway as you approach. Winter weddings can be harder here due to the restricted nature of indoor space, but when you hit a hot summers day this venue really sings! I’ve photographed several weddings over the past few years at Kingscote Barn, please read the wedding testimonials from those clients. If you are planning a wedding and are after a documentary wedding photographer please contact me to chat.